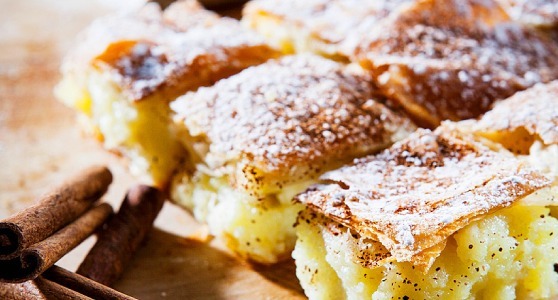 Layers of buttered filo encase a sweet custard which is baked into a golden flaky pie. Dusted with icing sugar and cinnamon, it’s the perfect accompaniment to, well, just about anything. Combine 3 cups milk and white sugar in a saucepan over medium-high heat. Bring to the boil. Remove from heat. Combine plain flour, cornflour, vanilla sugar, vanilla essence, egg yolks and remaining 1/2 cup milk in a bowl. Whisk to form a paste. Slowly add hot milk mixture, whisking constantly, until smooth. Return custard to saucepan. Cook, stirring with a wooden spoon, over low heat for 10 minutes or until thickened. Do not boil. Remove from heat. Add lemon rind. Pour custard into a heatproof bowl. Cover surface with plastic wrap and refrigerate for 3 hours or until cold. Preheat oven to 180°C. Lightly grease 2 large, flat baking trays. Place 1 pastry sheet on a work surface. Brush with melted butter. Fold in half crossways to form a rectangle. Spoon 1/4 cup custard onto pastry centre. Brush edges with butter. Fold long edges over to cover custard. Fold in sides to form a 7cm x 11cm rectangle. Place, seam side down, on prepared tray. Brush top with butter. Sprinkle with a little cinnamon sugar. Repeat with remaining pastry, butter, custard and sugar. Bake for 15 minutes. Swap trays over in oven and bake for a further 5 to 8 minutes or until golden and crisp. Stand for 10 minutes to cool slightly. Sprinkle with remaining cinnamon sugar. Serve warm. The perfect sweet for any occasion.